Die Künstlerin über ihre Arbeit mit Fotografie, Skulptur, Sprache und Identität. Ihr Fotoprojekt Shadows und die Gruppenausstellung Languitecture in der P21 Gallery, London, bis 30. Oktober 2016. My recent body of work is engaged in various themes. Among them is an investigation of photography as sculpture, and of the dialogue that can be created between image and object. I also explore creating a vocabulary that addresses the cultural shift from written to visual representation, that an image can be read like a word, and its meaning redefined. Finally, I use landscape to investigate my identity and examine the power structures that have governed the discourse surrounding that landscape. My focus often being a Middle Eastern landscape. In each project, the starting point was always an image or set of images that I processed in a sculptural manner. The images themselves became the material both in form and content. My studio practice began with making sculptures from photographs of the same objects. In my series Still Life (2010), the photographs themselves became sculptures, by shaping the paper they were printed on. This evolved into taking elements out of the photographs, both physically, by cutting them out in my installation The Apathetic Landscape (2013), and digitally, by erasing them in the series Shadows (2016). 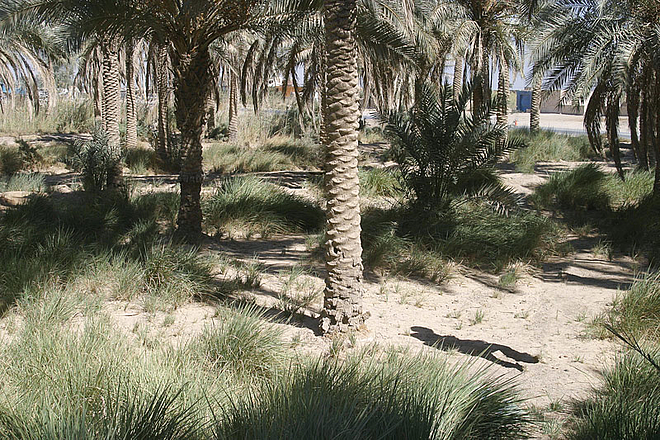 The Shadows project began when I searched online for pictures of the Anbar province in Iraq. I simply wanted to see the landscape and architecture, but the more I searched, the more I was unable to find images that didn’t depict Operation Iraqi Freedom. This moved me to modify the images and remove the soldiers to fully reveal the landscape. I chose, however, not to erase the presence of the U.S. occupation completely but to leave traces in the landscape in the form of the soldier’s shadows. Their imprint forms a part of the history of Iraq and their absence humanises their figure. The photographic archive of the U.S. army, which was made public domain, contained thousands of images. I chose images which depict an image of the Iraq that I had carried with me throughout my life. Landscapes and landmarks. Textures and colours. A picture of Iraq that was more than that which it was afforded. The images with their bylines, tell a story of how a war is documented and portrayed in public domain images to the rest of the world. The series also gives us a chance to reflect on what took place in this landscape and what the ramifications are, to this day. The narrative in this work, and all others, traverse many histories; of the landscapes or objects themselves and my own personal history. These histories are complex. Mine started in Baghdad in 1980. I was born a month before the Iran-Iraq war began. My family soon migrated to Abu Dhabi, before settling in Australia, when I was ten years old. Growing up with so many different influences led me to explore an idea of identity that is layered. From which no clear conclusion can be drawn, and where the elements are so intertwined that they bind us all, while being a celebration of difference. This theme is explored in Languitecture, my current group exhibition at the P21 Gallery in London. The project, by curator Rawan Serhan, is an investigation of migration, translation and the evolution of language. It involves interacting artworks by five different artists, working across mediums to interpret each other’s artworks. We are invited to observe what happened during this process of visual interpretation and whether we can follow the thread through the works. It also explores the idea of interpretation as finding a connection between your own experience and that of someone else’s. For this exhibition I have conceived an installation entitled Sirocco/Shlūq/شلوق. Named after the wind that blows from the Sahara desert across the Mediterranean to Europe, carrying with it swarms of warm sand. This work is based on a poem by Seamus Heaney called Had I not been awake. In contemplating my connection to my two mother-tongues, English and Arabic, I felt that it was embodied in my relationship with my grandfather. Growing up in Australia, I had refused to speak Arabic for fear of being different, it was only as an adult that I resumed speaking the language. So as my grandparents came to live with my family when I was a teenager, there was very little communication between us. And I missed the opportunity to get to know them. Many years later, as my grandfather was dying, I flew from Europe back to Australia and read to him the poem Had I not been awake, in English. He passed away that very day. The installation consists of a mountain range made from a transparent photograph of the Atlas mountains, a neon light script reading Had I not been awake in my own handwriting, a steel wire extending out of a small dune of sand to a flag-like appropriation of a photograph of the Sahara desert. These elements represent a tension between worlds, languages; what carries or blows one world and its words into the other, unassumingly forming an essential and rich part of it. As in Seamus Heaney’s poem, had I not been awake, I would have missed it. Nadine Hattom is an Iraqi/Australian artist, currently based in Berlin, Germany. * 1980 Bagdad, Irak. Lebt in Berlin, Deutschland.